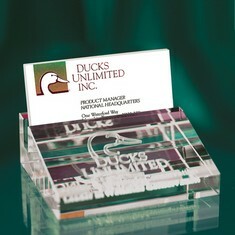 The Business Card Holder is clear and is made of optic crystal. The PCH33 measures 3 3/4"W x 1 1/4"H x 3 1/8"D, weighs 1.5 pounds and is presented in a custom gift box. The imprint area is 3 1/2"W x 3"D.
The Extra Large Rectangle Cube is clear and is made of optic crystal. The PMB47 measures 4 3/4"W x 7"H x 3 1/8"D, weighs 11.25 pounds and is presented in a custom gift box. The imprint area is 4 1/2"W x 6 7/8"H x 3"D.
The Extra Large Square Cube is clear and is made of optic crystal. The PMB04 measures 4"W x 4"H x 4"D, weighs 6.25 pounds and is presented in a custom gift box. The imprint area is 3 7/8"W x 3 7/8"H x 3 7/8"D.
The Extra Large Square Cube on Cut Corner is clear and is made of optic crystal. The PMB04C measures 4"W x 4"H x 4"D, weighs 6.25 pounds and is presented in a custom gift box. The imprint area is 3 7/8"W x 3 7/8"H x 3 7/8"D.
The Giant Rectangle Cube is clear and is made of optic crystal. The PMB48 measures 4"W x 8"H x 4"D, weighs 12.75 pounds and is presented in a custom gift box. The imprint area is 3 7/8W" x 7 7/8"H x 3 7/8"D .
The Large Cube on Cut Corner is clear and is made of optic crystal. The PMB03C measures 3 1/8"W x 3 1/8"H x 3 1/8"D, weighs 3.5 pounds and is presented in a custom gift box. The imprint area is 3"W x 3"H x 3"D.
The Large Square Cube is clear and is made of optic crystal. The PMB03 measures 3 1/8"W x 3 1/8"H x 3 1/8"D, weighs 3.5 pounds and is presented in a custom gift box. The imprint area is 3"W x 3"H x 3"D.
The Medium Cube on Cut Corner is clear and is made of optic crystal. The PMB24C measures 2 3/8"W x 2 3/8"H x 2 3/8"D, weighs 1.5 pounds and is presented in a custom gift box. The imprint area is 2 1/4"W x 2 1/4"H x 2 1/4"D.
The Medium Rectangle Cube is clear and is made of optic crystal. The PMB658 measures 2 5/8"W x 3 3/8"H x 2 5/8"D, weighs 2.5 pounds and is presented in a custom gift box. 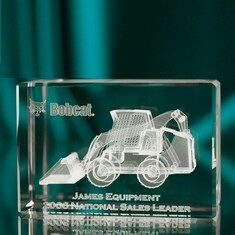 The imprint area is 2 1/2"W x 3 1/4"H x 2 1/2"D.
The Medium Square Cube is clear and is made of optic crystal. The PMB24 measures 2 3/8"W x 2 3/8"H x 2 3/8"D, weighs 1.75 pounds and is presented in a custom gift box. The imprint area is 2 1/4"W x 2 1/4"H x 2 1/4"D.
The Medium Square Paperweight is clear and is made of optic crystal. The PPW03 measures 3 1/8"W x 3 1/8"H x 3/4"D, weighs 1 pounds and is presented in a custom gift box. The imprint area is 3"W x 3"H.
The Medium-Large Rectangle Cube is clear and is made of optic crystal. The PMB682 measures 3 1/8"W x 4 3/4"H x 2 3/8"D, weighs 3.75 pounds and is presented in a custom gift box. The imprint area is 3"W x 4 1/2"H x 2 1/4"D.
The Octagon Beveled Paperweight is clear and is made of optic crystal. The PPW03B measures 3"W x 3"H x 1 3/8"D, weighs 1 pounds and is presented in a custom gift box. The imprint area is 2 7/8"W x 2 7/8"H.
The Octagon Paperweight is clear and is made of optic crystal. The PPW35 measures 3 1/2"W x 2 7/8"H x 3/4"D, weighs 1 pounds and is presented in a custom gift box. The imprint area is 3 1/4"W x 2 2/3"H.
The Oval Beveled Paperweight is clear and is made of optic crystal. The PPW34 measures 3"W x 4"H x 3/4"D, weighs 0.75 pounds and is presented in a custom gift box. The imprint area is 2 7/8"W x 3 7/8"H.
The Rectangle Paperweight is clear and is made of optic crystal. The PPW42 measures 4 3/4"W x 2 3/8"H x 1"D, weighs 1.5 pounds and is presented in a custom gift box. The imprint area is 4 1/2"W x 2 1/4"H.
The Rectangle Wine Stopper is clear and is made of optic crystal. The PWSR measures 1 1/4"W x 1 5/8"H x 1 1/4"D, weighs 0.5 pounds and is presented in a custom gift box. The imprint area is 1"W x 1 1/2"H.
The Round Beveled Wine Stopper is clear and is made of optic crystal. The PWSB measures 2"W x 2"H x 5/8"D, weighs pounds and is presented in a custom gift box. The imprint area is 1 7/8"W x 1 7/8"H.
The Round Paperweight is clear and is made of optic crystal. The PPW03R measures 3"W x 3"H x 1"D, weighs 1 pounds and is presented in a custom gift box. The imprint area is 2 7/8"W x 2 7/8"H.
The Round Wine Stopper is clear and is made of optic crystal. The PWSC measures 2"W x 1 7/8"H x 5/8"D, weighs pounds and is presented in a custom gift box. The imprint area is 1 7/8"W x 1 3/4"H.
The Small Rectangle Cube is clear and is made of optic crystal. The PMB58 measures 2"W x 3 1/8"H x 2"D, weighs 1.5 pounds and is presented in a custom gift box. The imprint area is 1 7/8"W x 3"H x 1 7/8"D.
The Small Square Cube is clear and is made of optic crystal. The PMB02 measures 2"W x 2"H x 2"D, weighs 1 pounds and is presented in a custom gift box. 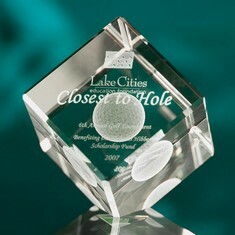 The imprint area is 1 7/8"W x 1 7/8"H x 1 7/8"D.
The Small Square Cube on Cut Corner is clear and is made of optic crystal. The PMB02C measures 2"W x 2"H x 2"D, weighs 1 pounds and is presented in a custom gift box. The imprint area is 1 7/8"W x 1 7/8"H x 1 7/8"D.
The Small Square Paperweight is clear and is made of optic crystal. The PPW24 measures 2 3/8"W x 2 3/8"H x 1"D, weighs 0.75 pounds and is presented in a custom gift box. The imprint area is 2 1/4"W x 2 1/4"H.
The Small-Medium Rectangle Cube is clear and is made of optic crystal. The PMB68 measures 2 3/8"W x 3 1/8"H x 2 3/8"D, weighs 2 pounds and is presented in a custom gift box. The imprint area is 2 1/4"W x 3"H x 2 1/4"D.
The Square Wine Stopper is clear and is made of optic crystal. 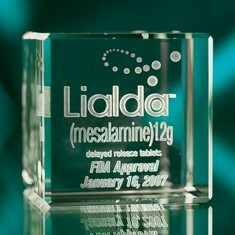 The PWSS measures 1 3/4"W x 1 3/4"H x 5/8"D, weighs 0.5 pounds and is presented in a custom gift box. The imprint area is 1 1/4"W x 1 1/4"H.